The Galiano Club Community Food Program and the Galiano Chamber of Commerce are offering Food Safe Level 1 on island. The course will take place June 10th at the South Community Hall. The class runs from 10am to 6pm. The cost of the course is $75, which includes the workbook and certificate upon completion. There are 30 spots available in this on-island class. Contact Alison at: galianofoodprograms@gmail.com to register. 15 sponsored spots are available for this class at a cost of $37.50. The Chamber will sponsor 10 spots for: Galiano Youth or Young Adults or Staff Members of Galiano Chamber Members. The Food Program will sponsor 5 spots for: Food Program Volunteers. This is a great opportunity to get your Food Safe certification on island (saving ferry costs) and at a discount. Foodsafe Level 1 is designed for people working on the front lines of the food service industry, from dishwashers to servers, bussers to line cooks and chefs. The course covers safe food handling, Hygiene, sanitation and work safety. In level 1 you’ll learn how to prevent foodborne illness, receive and store food, prepare and serve food safely, and clean and sanitize. 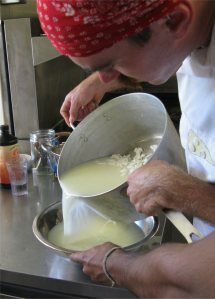 Make swiss style hard cheeses. Cable Bay Farm and Sunshine Farm are partnering up with the Food Program again this year to grow food for the community, the workers and the farms. Last year we led regular work parties up to the farms, and those will happen again this year (though not as frequently – call or email to get on the list!) But this year the farms have added a work trade. One day of labour a month gets you an irrigated bed. I tend to spend my time in the kitchen, where creating the feeling of community is easy and obvious – nothing better than breaking bread with people to get to know your neighbours. Last year I led some of the work parties to Cable Bay, and this year I joined the garlic co-op, and I have discovered that same sense of community happens in the field too. Whether its working with a large group of people to bring in the Squash harvest or chatting together as we move down the rows picking beans, farming is a great way to get to know your fellow islanders. So, if you’re thinking about signing up for a farm bed/labour exchange – think about it as community project. Yes, it’s also a great way to get a fenced, irrigated garden – ready to go. It’s also a great way to connect with a friend (or two), or your family. Take on a bed as a project together. (Two people can both work half a day a month at the farm as their labour exchange) Work together. Weed together. Carpool. Grow food together. Learn new skills as a family. Spending some time working with someone towards a common goal is satisfying, and enriches your own life – and you’ll be helping the community at the same time. Before we all become ‘squirrel-cage-busy’ with the spring time explosion of activity down on the farm (by the time you read this it will, in all probability, be in full swing!) it’s best to reflect on last year….what happened, how it worked and then, where are we going this year? First of all, last year’s farm experience is best remembered through the June 2011 Active Page article (pg 38) written by Roger and Lisa Pettit. Do you remember last spring? Maybe it’s best not to! Just forget about the whole darn spring that wasn’t…!! Rain! Rain! Rain! Every farmer in the Fraser Valley was doing what farmers do best….belly-ache, whine, moan and complain about something no-one could do anything about! The weather….!! Now, I think Roger got his potato crop in 5 weeks late, some farmers in the valley didn’t get planted at all, others were washed out or the fields were so soggy that everything rotted or couldn’t get harvested. Here at Cable Bay Farms the old Ford 8N blew a head gasket; we were scrambling to get fences repaired, trying to cultivate fields between rain squalls and someone very kindly pointed out that new potatoes from Oregon State could be bought at Safeway for $5.25 a pound! Jeez! Just doesn’t get any better than that eh! It was becoming very apparent that the bottom line contribution margin on any crop was going to be very slim pickings! But, there was one very bright light in the Galiano Food Program’s activities last year, Janice Oakley and Alison Colwell became very efficient Field Crop Admirals. Now, before you think this inappropriate or faintly humorous…..who else but an Admiral could marshal field troops, actually get crops planted in the most difficult spring season for decades, keep morale up during lousy weather, maintain a consistent crew of harvesters twice a week, deal with a crop of rapidly deteriorating field squash…..and then to top it all off, produce the best damm apple-squash soup to feed hundreds at a community picnic! Now that’s admiral stuff eh! And, may I remind you….at the end of season picnic, you ate locally produced potatoes, apple strudel, roasted squash, beets, pickled beans and raced modified Type A Zucchini when a lot of Fraser Valley producers couldn’t even harvest a crop. 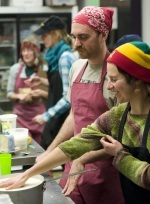 Me’thinks there was more than just one bright light in the Galiano Food Program last year eh? So, where are we going this year? Actually, it’s going to be bigger, better, more efficient and more productive than ever on the farms of Galiano Island. New, highly efficient seeders, raised bed shapers and transplanters are on Galiano, new crop sharing arrangements have been formulated and although there is an abundance of optimism over this year’s potential…there is one disquieting thought? How will the GFP volunteers cope with such an abundance of harvested field crops? Some problem eh! 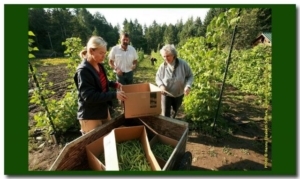 Okay, now down to the nitty-gritty of the 2012 Galiano Food Program’s Farm Experience. Here, in point form is how it’s going to work out…hopefully! Remember, good farmers utilize an emergent strategy style of operational excellence in adapting to changing circumstances, in the end after all, that’s how you got fed last year. Get yourself on the ‘Admirals List’. See Janice or Alison for a 1 day/ month work day schedule (for 6 months) at either Sunshine Farm or Cable Bay Farms. A share of the field crops grown for the Galiano Food Program. Cable Bay Farms will be accepting qualified participants for Tuesdays. We like to call it ‘Cable Bay Tuesday’. Sunshine Farms will be accepting highly motivated individuals for both Thursday and Friday’s. After all, Sunshine Farms is a Saturday Market Field Crop Vendor. So, it’s all pretty simple. The work planned down on the farm (watch for the GFP work parties; Cable Bay Tuesdays & for Sunshine Farms – the days will be Thursdays & Fridays) will be posted a week ahead on the wonderful community CALENDAR at www.activegaliano.org/calendar-galiano-island-events. So anyone interested can check out what’s happening directly, then call the Food Program at 250.539.2175 and get yourself on the ‘Admirals List’. Oh, by the way? If this season’s crops are assisted with a helping hand from Mother Nature’so fickle weather way’s…. everyone will have almost more food than you can handle grown right here on our own Island! The seed starting group got off to a solid start on March 4th with our first plantings of the season. Initial attendance went from 7 participants to a total of ten participants by the end of the month. At March’s first meeting, seed starting soil and soilless mixes, their components and purposes were discussed. The agreed upon recipe was made up in a large enough batch for everyone to plant their seeds. The initial planting included parsely, celery, fennel, onions of various types and leeks. At the next meeting planting included peppers, eggplants, fennel and some brassica. Discussion continued regarding seed starting mixes and the overall comparative pros and cons of coconut coir vs. peat moss as a base for mixtures. A member volunteered to do some research into the sustainability and carbon footprint of peat moss. At this meeting, it the group decided to reduce the amount of sand in the chosen recipe as the previous mix seemed a bit heavy. Germinating and watering instructions were reviewed as well. The third meeting of the month focused on planting greens, chois, kale and a second planting of onions and leeks. The discussion regarding peat moss vs. coir continued with it being reported that the harvest of peat moss in North America was quite harmful to local plants and wildlife. Cleanup of the greenhouse beds began with many foodplants being finally removed after overwintering to make room for this seasons plantings. Some sprouted celery seedlings were removed from the greenhouse beds and transplanted to containers for members. At the final March meeting we planted broccoli, cabbage and various greens including lettuce, corn salad, kale and choi. Members brought trays of sprouted vegetables and herbs from earlier plantings to review and evaluate. 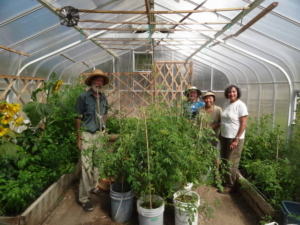 The impact of full spectrum light was obvious with the plantings of the same seeds that then went to different households, creating much quicker and fuller growth in the seedlings. The heavier coir mix with the initial measurement of sand appeared to be too heavy for some seed to germinate, while the same mix with added perlite for aeration did fine. Using this mix in a solid tray seemed to retain far too much moisture and resulted in pretty much no germination and damp off of the few seeds that did sprout. It was suggested that the same mix might work better if perlite were added and it was put in upright pots rather than a flat tray. Bottom heat was also suggested to encourage germination and it was noted that peppers and eggplants both need a very high soil temperature to germinate which could best be achieved through the use of heating pads, sheets or cables. A final cleanup of the greenhouse beds was done before the meeting ended, making room for the hot weather plants that will go in there this season. It was also reported at this meeting that the processing of coconut coir requires huge amounts of fresh water and typically travels through several countries before arriving at the west coast of Canada for sale. This suggests that the choice between peat moss and coconut coir as a base gardening material is not as clear as we thought and really one has to weigh the different pros and cons and make an informed decision knowing that the harvest and preparation of both have a negative environmental impact. In April we will be transplanting our seedlings, sharing our existing sprouted plants amongst the group and starting to plant more warm weather plants such as various tomatos, cucumbers, basil, summer squash, melons and winter squash. 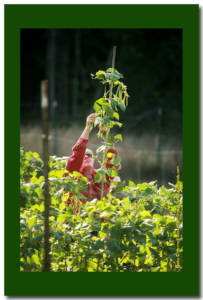 Depending on the spring weather, beans may also be started in containers to get a jump on the season if cooler. The remaining celery seedlings in the greenhouse beds will be transplanted and shared out to go in the school garden and personal gardens of members as well. Our recipes for starter mix and transplant mix follow.